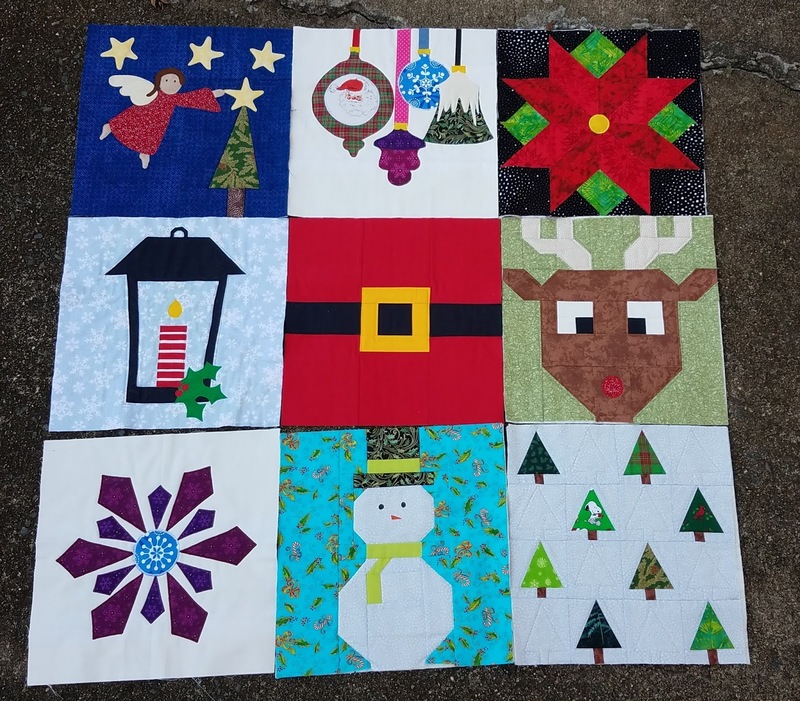 2017 was a bit of a milestone for me, quilting wise. I took a quilt class in the fall of 1997 as a sophomore in college (not curricular!) 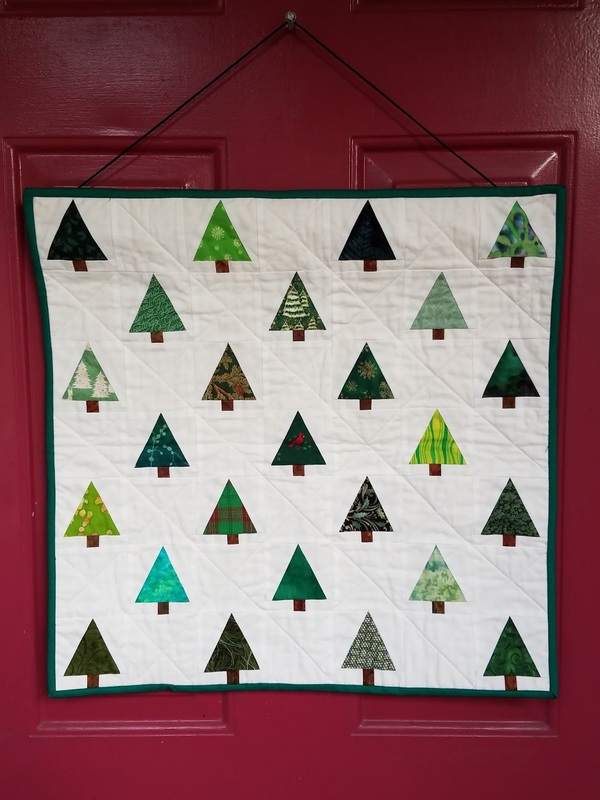 so fall of 2017 marked my 20th anniversary with quilting. And since I turned 40 earlier in December, I have now officially been quilting half my life! As the year draws to a close, it is time to look back at 2017 and see how I did on my goals, as well as to set goals for 2018. Yvonne aka Quilting Jet Girl hosts a yearly goal-setting party, which I really enjoy. 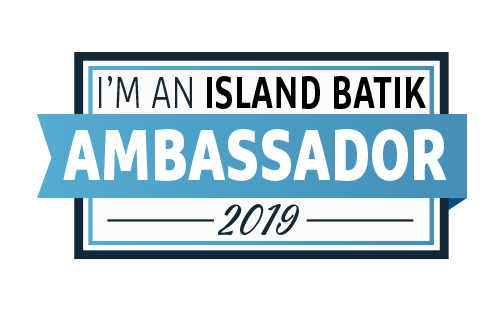 It's great to see what others set as goals for themselves as well as to have the opportunity to put my own goals out there and have some accountability. I didn't so much tackle this one as give up. I decided that I am okay not being comfortable with big quilts. The one really large quilt that I made, I sent to a long-armer. 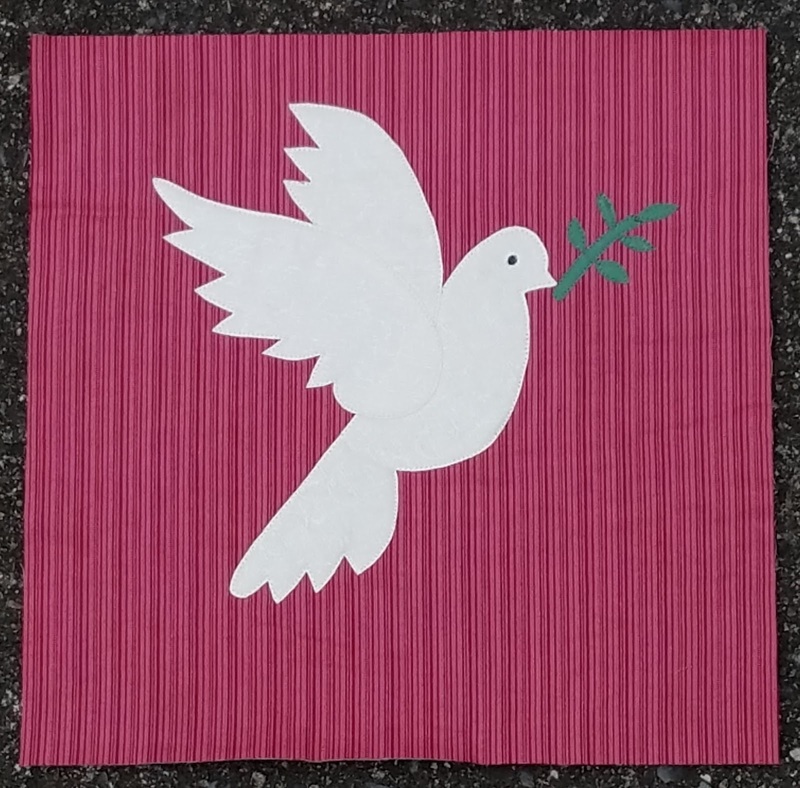 I have come to peace with not loving big quilts, especially the quilting part. As mentioned in the original goal, this is hard to quantify. I bought a lot less than I have in previous years, and I bought very little fabric in the first several months of the year. I also made far fewer trips to my LQS which cuts down on the buying. Success! I was in 2 bees in 2017 and was on time with all my blocks! That phrase is in quotes because it comes directly from Diana at Red Delicious Life. I will also call this one a success. 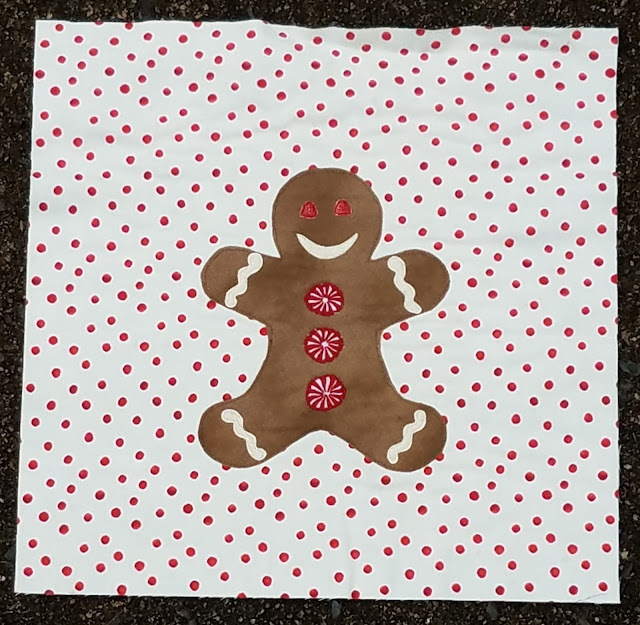 I sat out both the mystery quilt alongs I had done each of the 2 years prior and I sat out many other QALs so I could concentrate on other projects. I did join 2 QALs that were unplanned and I do not regret either--they were chose somewhat intentionally and were fun, as opposed to a chore to keep up with. More success! My husband gave me a logo for Mother's Day and Valerie of Valerie of Inkblot Design Studio did an amazing job. I also moved to a professional blog template and am very happy with the overall look. This one didn't go so much for me, though I did say in the original goal that figuring out if it works for me was the goal, so in that sense I guess I was successful. I really like the idea of the Quilter's Planner, but I found that I didn't use it really at all after March. I'm going to try something new for 2018. 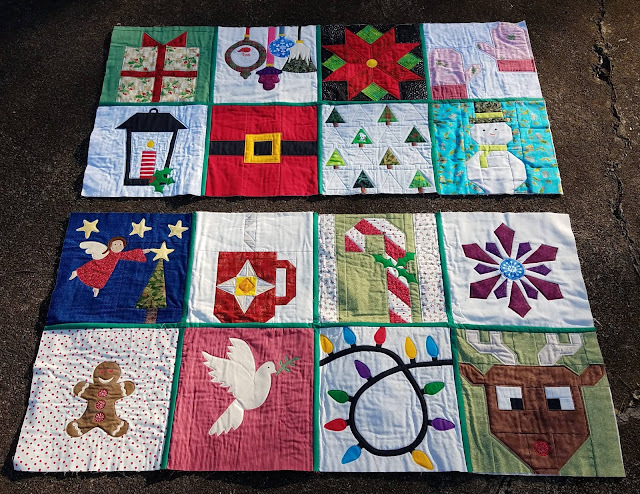 12 quilts donated to Project Linus -- Even better--13! 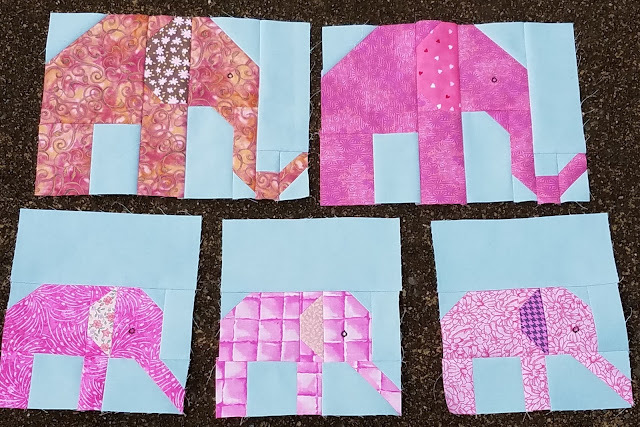 6 mini quilts or pillows completed -- Yup! Several small projects completed! 6 scrap projects completed --Yessiree! I lost count but did finish many scrap quilts. I also made a list of 12 projects as a part of All People Quilt's 2017 UFO challenge. I completed 6 of 12 projects on that list. I'm in 2 bees again this year and am Hive Mama for both. I'm also part of a secret project in the spring and would like the opportunity to take on more commitments in the quilting community. I have five bed-sized quilts in various stages of completion that I would like to finish: Laura's Quilt, I Spy for our bed, I Spy for Mom, Bookshelf quilt, and food-themed picnic blanket. Overall, I want to use far more than I buy and I think tracking usage will help. I also plan to track fabric purchased. I don't have a quantitative goal for yardage out but I am curious to see the numbers. Using the Quilter's Planner didn't work for me so for 2018, I bought a pretty blank book and plan to use it to track just a few things. I'm hoping that going simpler will mean I keep up with it. Part of this goal is to figure out what I want to keep track of. I like the idea of tracking yardage. I wish I had a better record of when I finish projects. Kate at Life in Pieces tracks the days she spends at least 15 minutes sewing and that sounds intriguing to me. So I guess I'll start with these and see how it goes. That phrase is in quotes because it comes directly from Diana at Red Delicious Life. This is a repeat from last year and I'm hoping I can do as well again. I like to join in on the fun but I have so many projects already that taking new ones on can stress me out when I feel like I need to stay caught up. I felt like I had a good balance this year and I strive for that again in 2018. So I guess one way of looking at this goal is "join some of the things but not all of the things." It's so hard for me to spend time cleaning up or organizing, partly because I don't really enjoy it (though I enjoy the finished product) but also because I'd rather be sewing with that time. This is an example of where I'm hoping that writing it down helps me make it happen. I don't have dreams of it being completely neat or organized, but better than it is would be nice. Part of this is likely to include giving away abandoned projects. 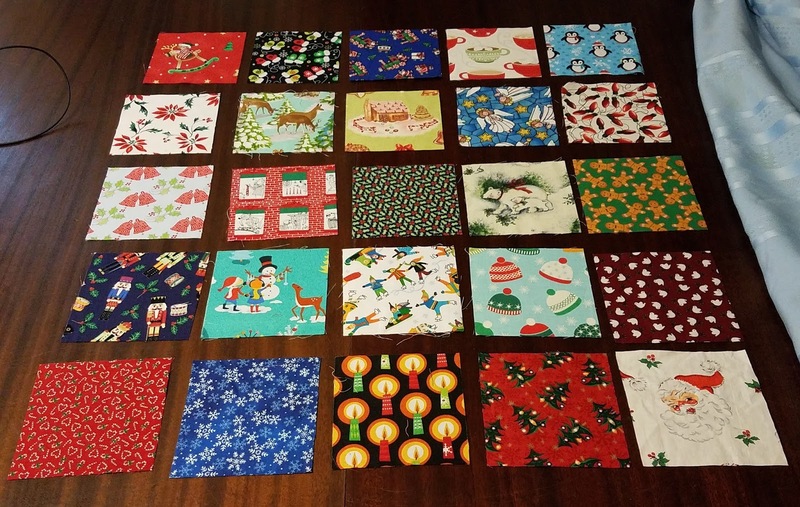 Goal: 12 Quilts for Project LinusThis is my standard yearly goal since I got involved in 2015 and works out to one a month, though that's never how they actually get finished. I tend to work in spurts. I also attend monthly meetings of the Charlotte chapter. In 2017 I lost about 15 pounds. I'd like to lose at least that much again in 2018. Ultimate goal is 40 pounds from starting weight. My husband is from Mexico and is a native Spanish speaker and of course so are my in-laws. While all of them are fluent in English, they would much rather speak Spanish when they are together. It is past time for me to learn Spanish. I've made a few attempts but nothing has lasted. One of the perks of my job (I'm a librarian at a community college) is that I can take 1 class per semester for free. I am registered for a Spanish class that starts in January. I am aware that the class will cut into my sewing time but I think that the time investment will be worth it. And I have a live-in tutor! I had a good year in 2017 and am ready to see what 2018 has in store for me. Happy New Year! Christmas is over but I'm still working on my I Wish You A Merry Quilt Along quilt. 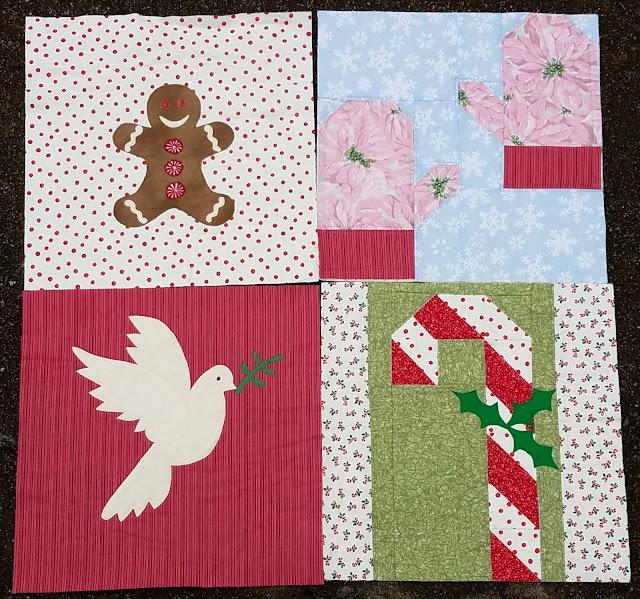 My goal for the OMG linky party hosted by Patty at Elm Street Quilts for December was to complete my blocks and assemble each of the four rows. I'm happy to say I made it and got a little bit further than anticipated. I finished all my blocks: the 12 original blocks and 4 bonus blocks. I did quilt-as-go, so everything was quilted before assembly. Nope, not quite complete. It's currently in 2 sections. All four rows are assembled and have been paired and sewed into the next step. Now I just need to sew those together and bind! 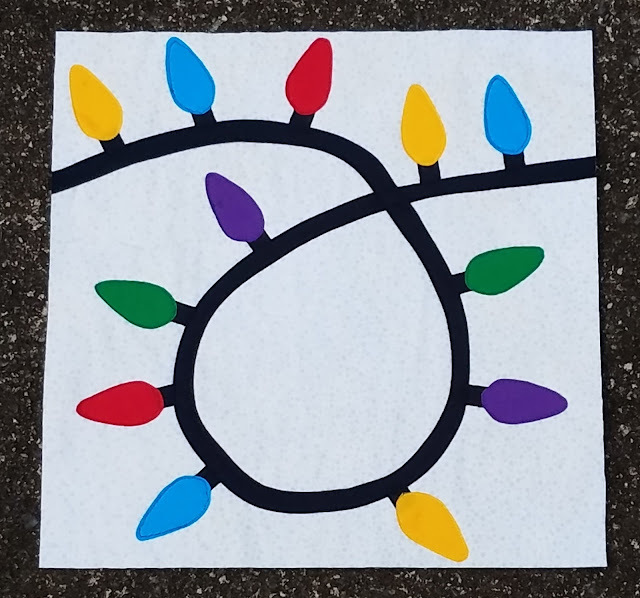 To get two for one, I'm making completing this quilt my OMG for January 2018. My son and my niece are both 4. This means they are both at an age where dinosaurs are particularly interesting. My public library has a great book called Playful Hoodies by Mary Rasch that has 20+ costumes you make with a hooded sweatshirt. 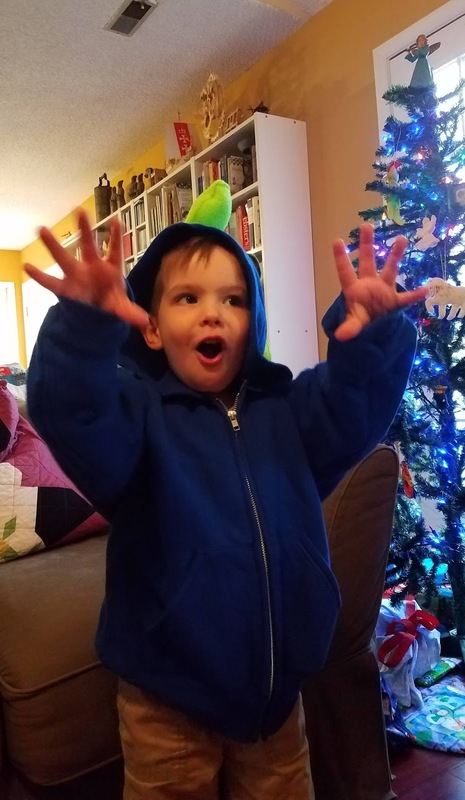 Dinosaurs are one of the patterns and I decided to make both kids dinosaur sweatshirts for Christmas. The dinosaur scales are made out of fleece. Since I back most of my Project Linus quilts with fleece I have lots of fleece scraps, making this a scrap project for me. My son's sweatshirt has 2 different shades of green in an alternating pattern. He loved it and put it on as soon as he opened it. 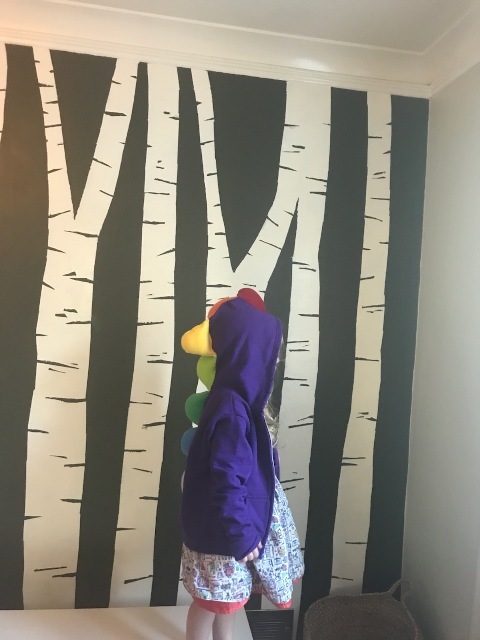 My niece is crazy about rainbows, so her sweatshirt is a rainbow dinosaur. I was lucky enough to have fleece scraps of all the rainbow colors (though the purple is a very pale purple) and put the scales down her back in rainbow order. Since this is technically a scrap project, I will be linking up with Oh Scrap! hosted by Cynthia of Quilting is More Fun Than Housework. 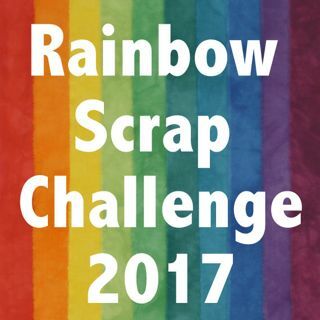 For most of 2017, I kept up pretty well with the Rainbow Scrap Challenge. Until September. Fall is always busy in my house and the rainbow elephants fell by the wayside. 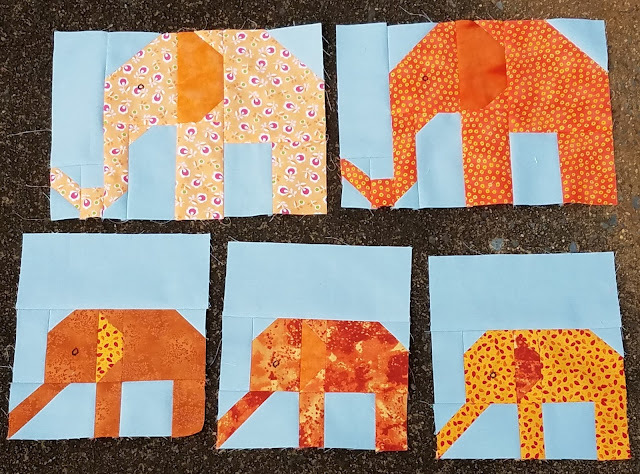 The pattern I'm using is Elephant Parade by Lorna of Sew Fresh Quilts. Each color family has now been sewn into rows and 4 of those rows are sewn together. Sadly, that's when I ran out of background fabric, so I am stalled until I can get some more Kona Fog. I was at my LQS 2 weeks ago and they didn't have any so it's an online order for me. That means I won't actually finish my 2017 rainbow quilt in 2017 but this hopefully won't bleed too far into 2018. The final block has been released and I've finally finished them all! 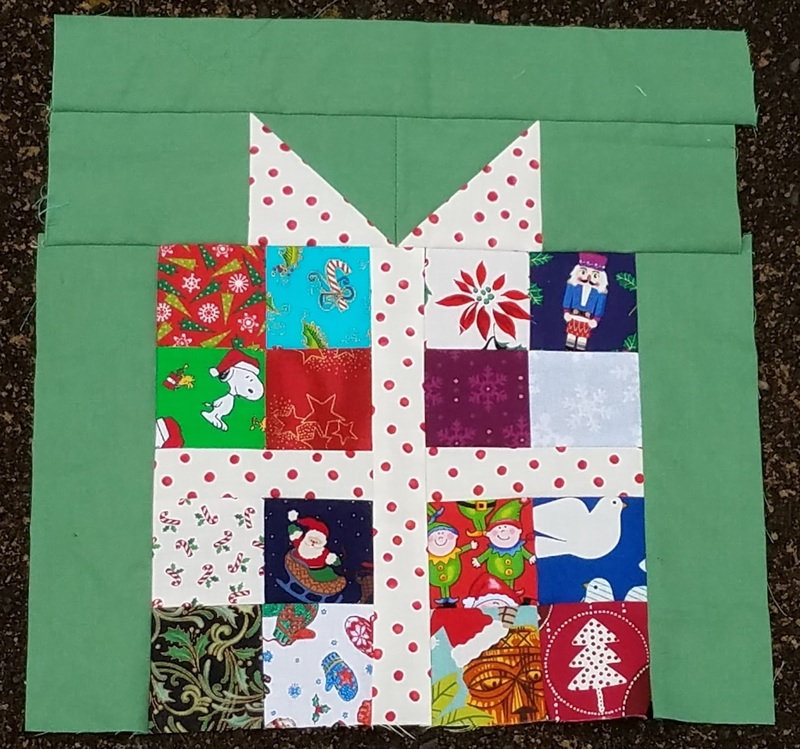 I Wish You a Merry Quilt Along has 12 blocks and they've been released every two weeks since August. One of the great things about this quilt along is that we are encouraged to make the blocks our own. 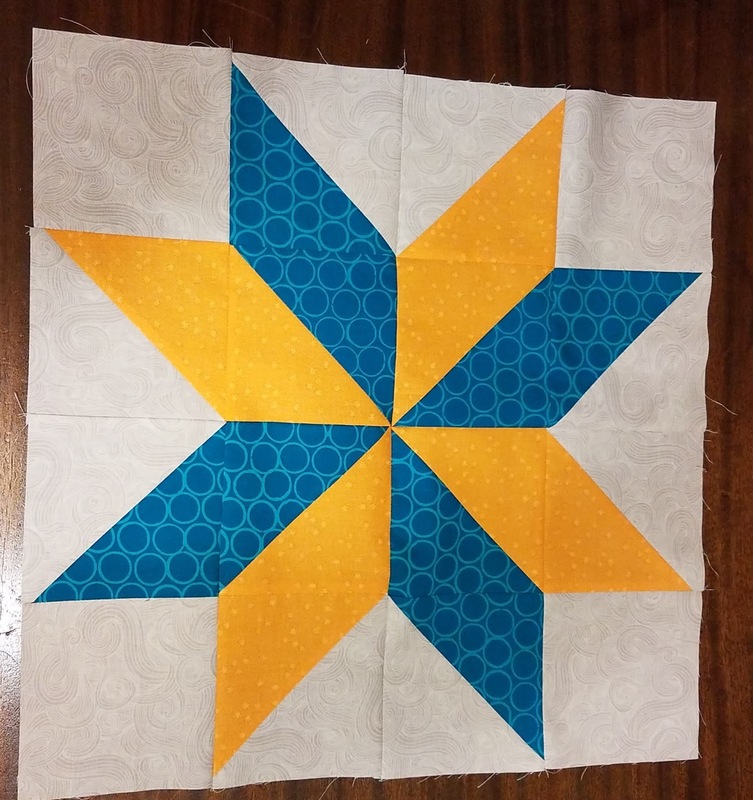 I've done some minor adaptions to various blocks, but I went a little farther out of the box with block 11: The North Star designed by Kathleen McMusing. I've been planning to make 4 extra blocks so I can get a 4 x 4 setting. I made a list of possible things to include, and my list was *way* longer than 4! So as we've gotten closer, I've looked for ways to incorporate things from that list into the original blocks. When I saw the North Star, my first thought was to put it on top of a tree with lights, as lights is one thing I really want to include. But I couldn't get the placement of the star figured out and the scale would have been really far off. So I put my North Star on a mug of hot chocolate! 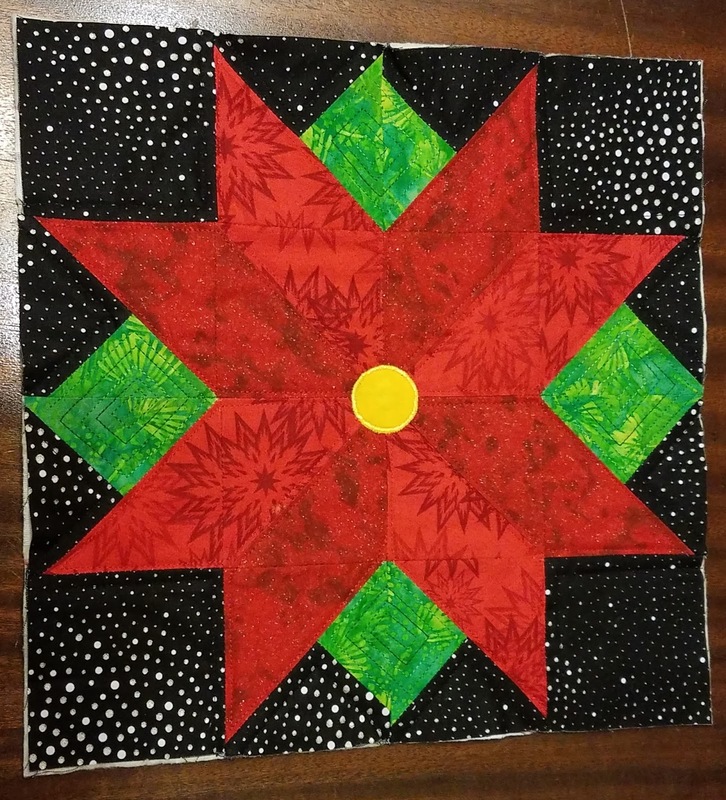 I used the paper pieced pattern for the star points and reduced the to 50%. I took my inspiration from the In From the Cold pattern by Kate Spain. This is essentially mug #3. I love how it turned out! Block 12 is a string of Christmas lights. Lights were one of the things I was hoping for so I was really happy to see this one. This was my first time making and using bias tape. I did not enjoy making it, but it did bend/flex quite easily. This is one of my favorite blocks! I did make the original block 8 which was the presents block designed by Alice Samuel's Quilt Co but I wasn't crazy about how mine came out. So I made a different present. I modified a tutorial to be the correct size. But it was too...messy looking and not distinctly a present. Version 2. I wanted to like this one! I left it around for a few days hoping it would grow on me, but it didn't. So I created a simpler present and found that the third time was the charm. I am now working on joining the blocks. The quilt as you go method that I'm using involves some hand sewing, so this will sadly not be done by Christmas day. Our celebration with Husband's family is Christmas Eve day so my time will not be spent sewing. Still, I've really enjoyed the quilt along and love the project so far, even if it won't be done for the big day. Wishing everyone a joyful holiday! Merry Christmas! I loved the Christmas Tree Farm block by April of JANDA Bend Quilts so much that I expanded the original block and turned it into decoration. It's now hanging on my front door. Tree Farm was project number #1 on my list of Q4 goals for the globally hosted finish along. 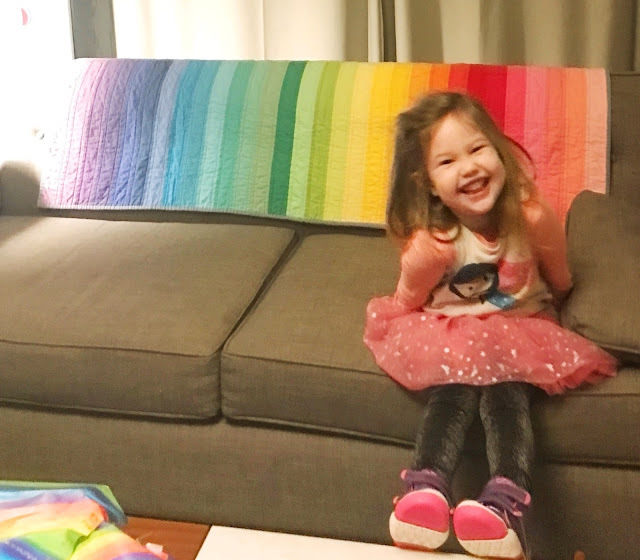 My niece, who turns 4 today, is crazy about rainbows. My sister-in-law tells me that she carries the rainbow doll quilt that I made her everywhere she goes. Earlier this year, I made a rainbow quilt for myself with a Kona jelly roll. I decided a few weeks ago that Noodle would get even more joy out of it than I do so I sent it to her for her birthday, along with some rainbow knee socks and a few other goodies. Totally the right decision! Look at that smile! And my sister-in-law managed what I could not: a decent picture of the quilt. Rainbows are the best. Happy Birthday, Noodle! Flying Geese. Seems quilters either love them or hate them. I don't exactly hate them, but I certainly don't love them either. And yet as luck would have it, both November Queens in my online bees asked for blocks that feature flying geese. One of the reasons I love these bees is that it forces me to make things I wouldn't pick. And I while I wouldn't have picked geese-heavy blocks, I liked these! Queen Laura asked for Scrap Bag Geese in any and all shades of pink. I liked doing the geese in two parts and putting them together, so these scrappy geese were actually a lot of fun! I enjoyed these and think that all the pink geese will look amazing together. Can't wait to see them all fly! 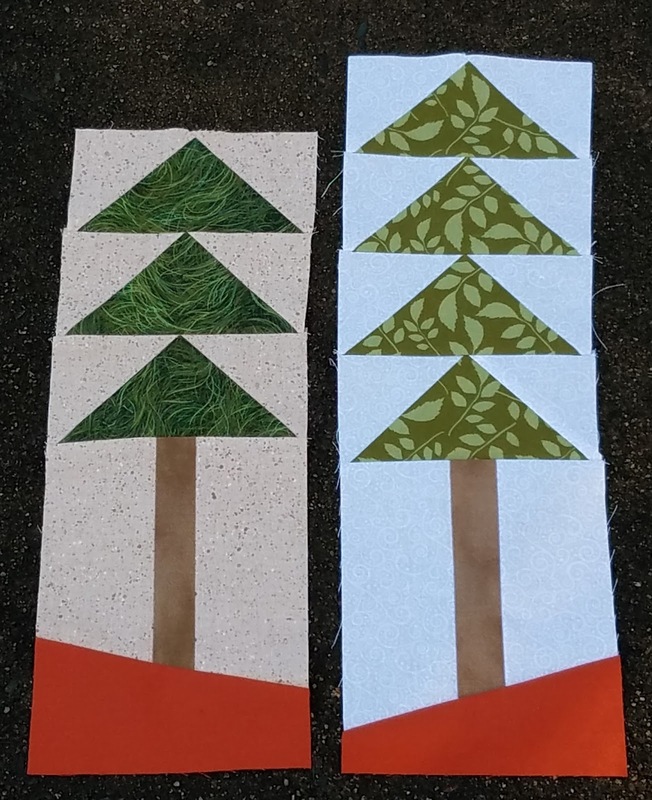 Queen Paige designed her own tree block in honor of the Loblolly Pines in her part of South Carolina. She sent each member of our bee some ground fabric and I love it--it's the color of Carolina red clay! Paige gave us some wiggle room on the height of the block because her setting allows for variation. Good thing, because mine are not the same at all! I love these trees and think Paige's quilt will be amazing. And while this block wasn't for a bee, it doesn't really fit anywhere else. When I was at QuiltCon way back in February, the Michael Miller booth let you pick out 4 fabrics from a list and cut you a sample of those fabrics. In return, they asked for 6" (finished) blocks that will be turned into quilts for kids' charities. I completely forgot about this until I found my fabric bundle and saw that I still had a week before the deadline. I looked through some block choices and picked out Quatrefois. I used this tutorial. I really like this block and think it's something I am likely to make again in the future. This ends the year for me in terms of bees. Stash bee runs January-November, so this was it. Bee Inspired does have a December queen, but it's me! So I get to sit back while others make blocks for me. I really like these online bees: I make new friends and I get to try a lot of different blocks. I'm in for another year of both! 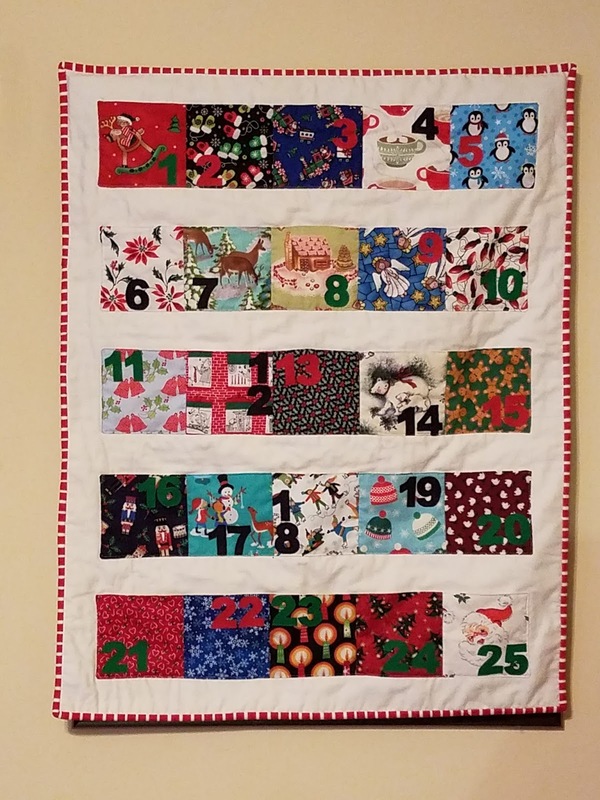 My goal for November was to make a quilted Advent Calendar in time for December 1st. Made it with one day to spare! I looked at a few patterns and read several tutorials and ultimately followed the method of this tutorial by Fanny Lu Designs. I really wanted to use the 5" squares I have collected through various I Spy swaps over the years, so my measurements don't match hers, but I did use her method of making the pockets. I have number templates that I've used for several other projects that I traced onto fusible web for the dates. The background is Kona Snow. The backing is a really fabulous Alexander Henry Christmas fabric with Aloha Santa (I have no idea what it is called). 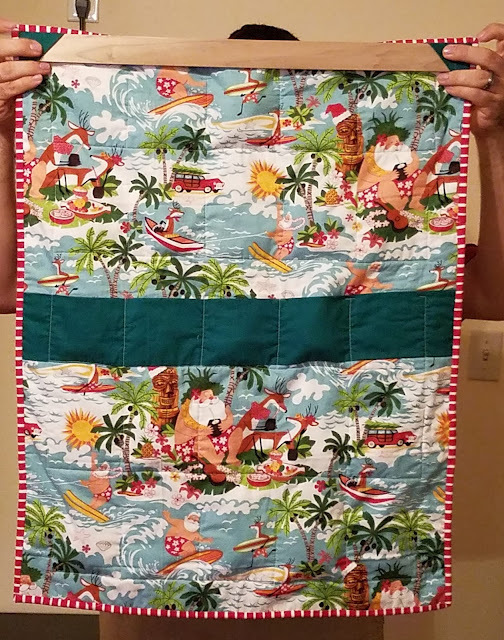 I had 2 half-yard cuts that were prizes from a promotion at a local quilt shop a few summers ago. It was a "finish your projects" initiative, and for every 2 projects you finished off your list, you got a prize bundle of 2 half yards of fabric. I think I finished 8 projects that summer (great incentive!) and this fabric was in two of my prize bundles. The solid on the back is Kona Willow. The numbers are scraps of Kona Red, Clover, & Pepper. 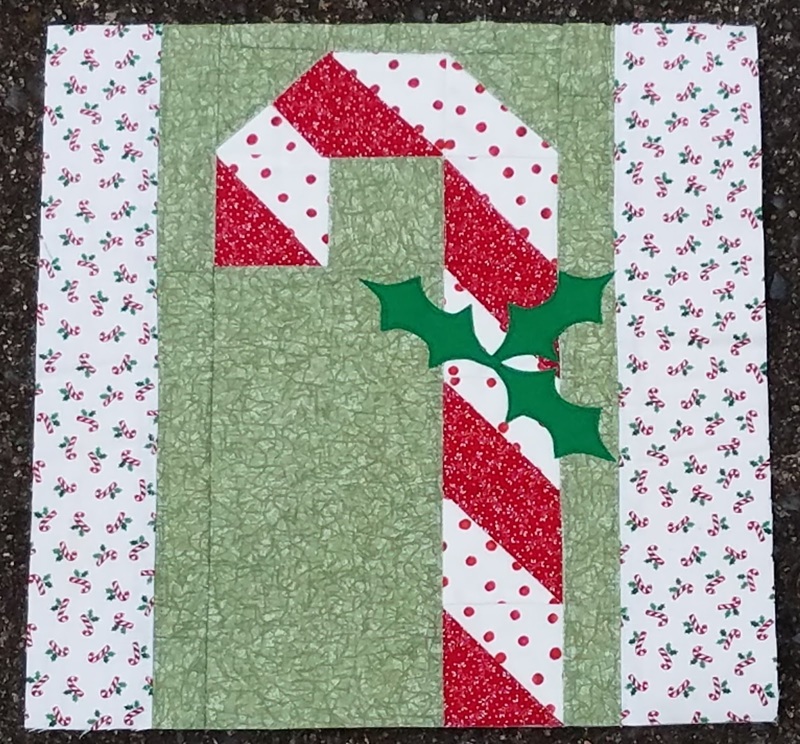 The red & white stripe in the binding was also from one of those prizes, and as soon as I saw it I know I would use it for the binding of the advent calendar whenever I got to it. I love how it looks. Munchkin still has Halloween candy so I didn't want to do chocolates or candy in the pockets. Several days have stickers. I bought some small dinosaurs at the dollar store, I bought a Mickey Mouse stamps set from the dollar section of Target that I split up, and I bought a package of Paw Patrol socks--luckily his feet are still small so the socks fit in the pockets! Nothing big, but I think he will like getting a small surprise every day. Here it is after Husband and I filled the pockets. Finishing the Advent Calendar was my November One Monthly Goal for the linky party hosted by Patty at Elm Street Quilts. Yes, I realize we're now past Thanksgiving! But I never posted about my Halloween costume. I used the book Playful Hoodies by Mary Rasch to turn a red hooded sweatshirt into my Red Riding Hood costume. This book is great! 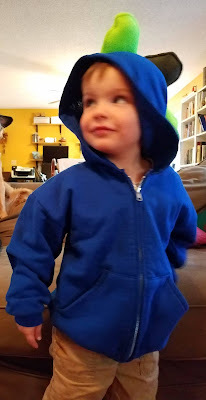 I also used it to make Munchkin's Superman costume last year and there is a dinosaur sweatshirt on the horizon for Christmas if I can get it done. I don't know if you can tell from the picture, but there is red ribbon all along the part that was cut, which is really what makes it look like a finished piece of clothing. I don't sew clothes, but this was more or less within my capabilities. You can tell it used to be a sweatshirt, but it's also pretty clear who I am. I work at a community college library and I like my costumes to be recognizable by a large percentage of my population. It was also comfortable to wear all day. 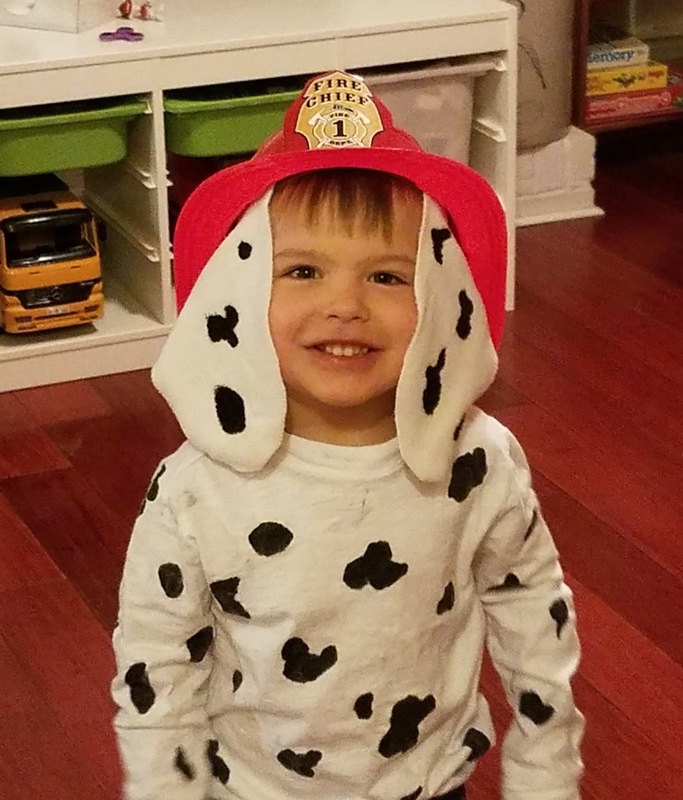 Munchkin was a dalmatian for Halloween. I spent about $10, as I bought a long-sleeved white t-shirt, black paint, and fabric medium. I then painted random black splotches on the t-shirt. I asked if he wanted ears and he said, "yes. And a tail." Tail! I hadn't thought of that! Sadly, I can't find the picture of the tail but he still wears the shirt, so I will take a picture next time. I used some scrap fleece for both the ears and the tail. 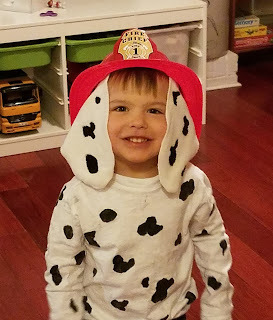 The ears were glued into his fire helmet (Christmas present from Grandma last year) with hot glue. I sewed the tail into a tube and attached it to the bottom of his t-shirt: the only sewing in the project. 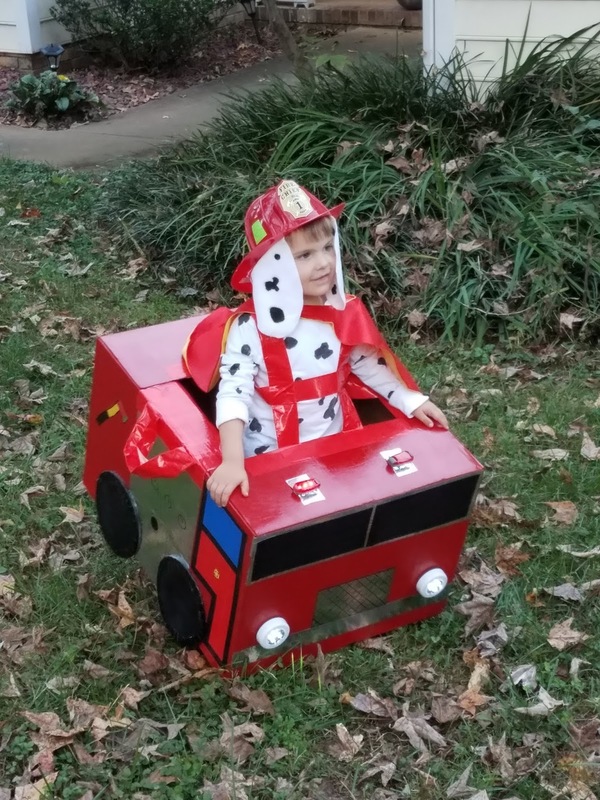 But the best part of his costume wasn't made by mom, it was made by dad. A fire truck! 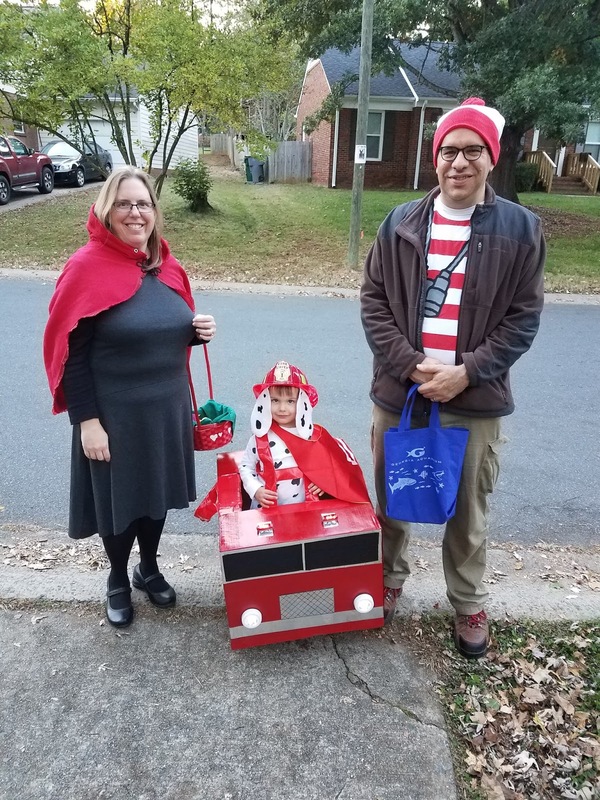 This was a large box that Husband turned into a fire truck. It has headlights (touch lights from the dollar store) and flashing lights (the kind bicyclers frequently wear). It is truly amazing. A little hard to maneuver down driveways, but amazing. 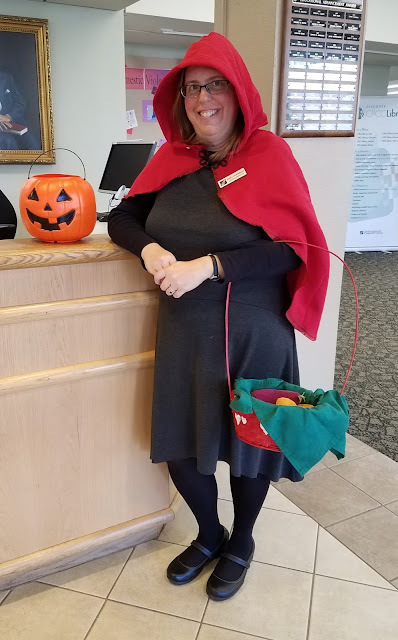 My Red Riding Hood cape was project number #18 on my list of Q4 goals for the globally hosted finish along. My deal with myself when I decided to start yet another project is that I can't buy anything for this project; everything (including batting and backing) is coming from stash. In the beginning I was worried about the lack of a unified look, but now I figure there is enough variety that scrappy will look just fine. I've previously showed blocks 1-5. However, I've redone two of those. 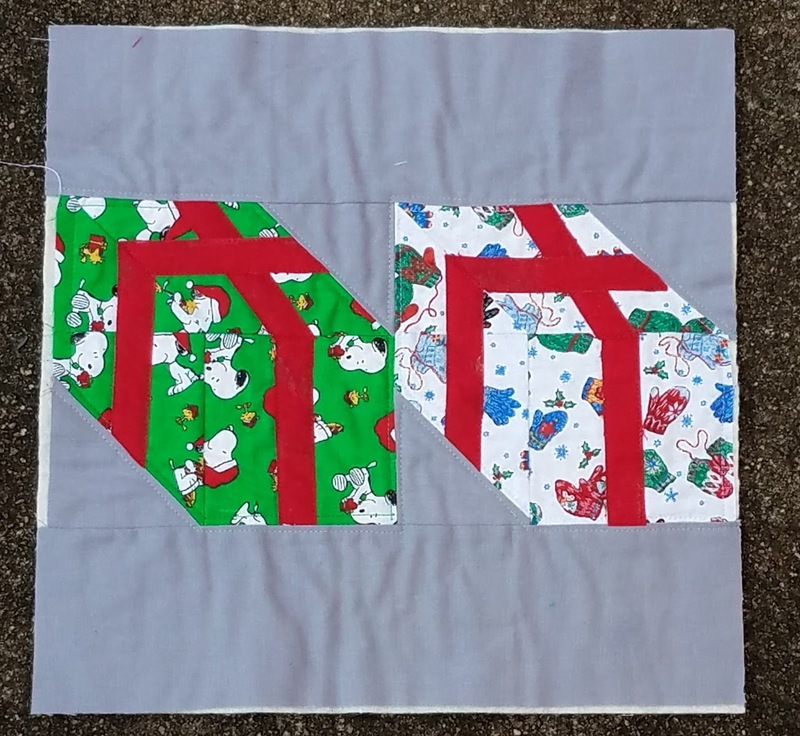 First, I decided that my original Santa's Belt (block #3) was too abstract to be immediately recognizable, so I redid it with solids. I forgot to take a solo picture, but you can see in the center of photo above. 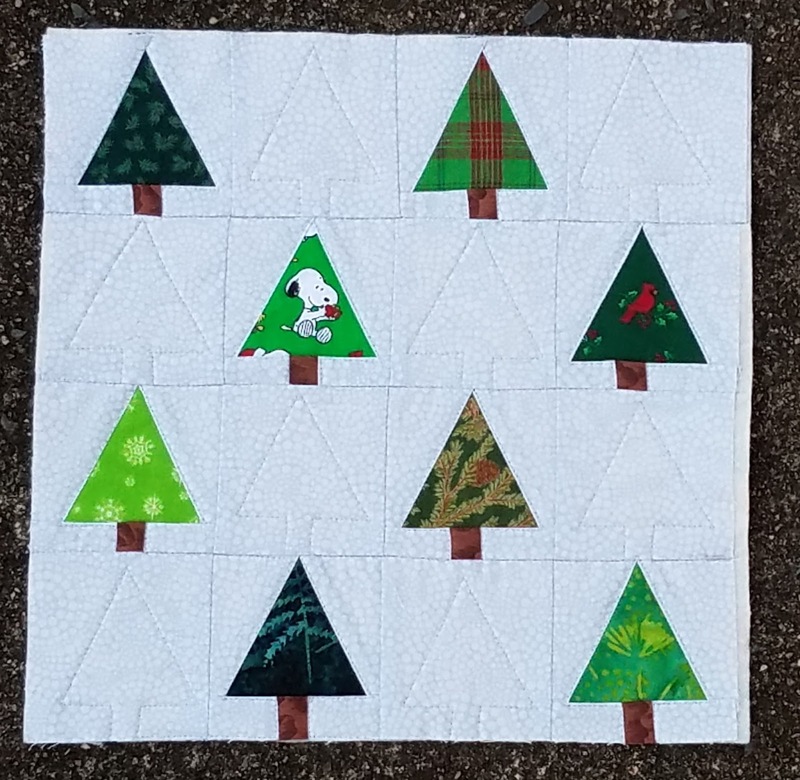 I liked Christmas Tree Farm (block 2) by Janda Bend Quilts so much that I expanded it and turned it into a holiday decoration (blog post coming) so I needed to make a second version for the quilt. 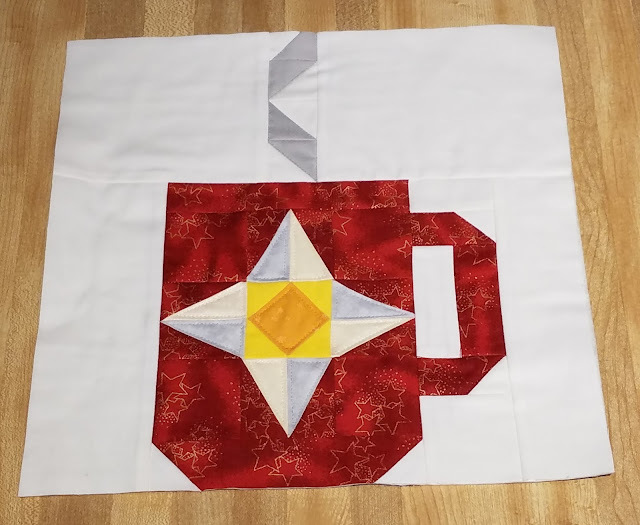 One of the QAL hosts is also doing quilt as you go and I LOVED her quilting design, so I copied it. Don't you love the outline of the trees in the empty squares? Block 6 was an angel designed by Sandra Healy. I modified this one a little bit and am really pleased with my version. 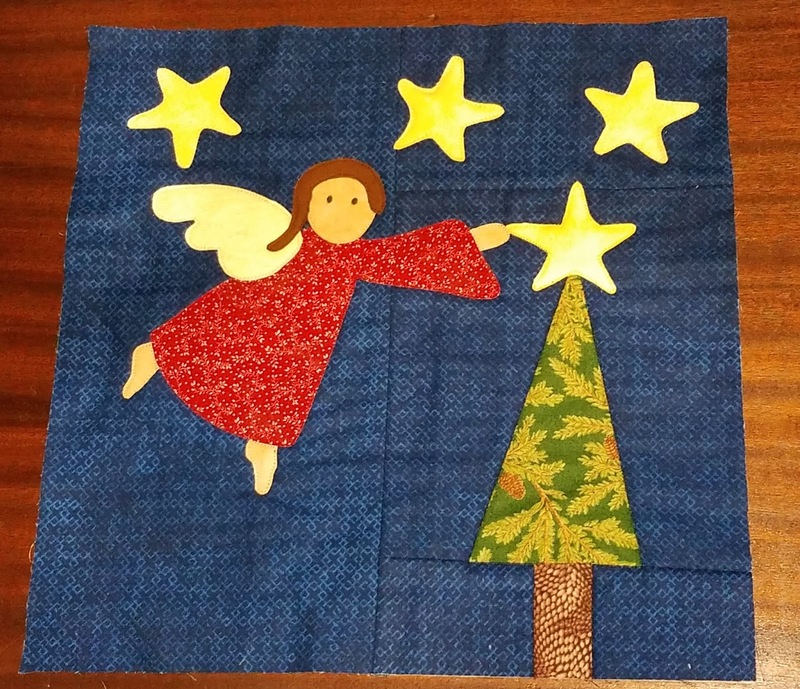 I simplified to one background and added the tree as if the angel was putting the star on top. Block 7 is a Poinsettia and comes from Sandy Star Designs. My points don't really match on the leaves but I'm going with it anyway. I used one of the circles on the train die with my AccuQuilt to get the perfect circle for the center of the flower. Block 8 is not pictured in the group photo, though I did make it. It's a pair of presents and comes from Alice Samuel's Quilt Co. After seeing a lot of quilters struggle with this block on Facebook, I decided to use the alternative instructions from host Pretty Piney and do the ribbon as all applique. I'm still not really pleased with it and I'm not sure I'm going to use it my quilt, to be honest. 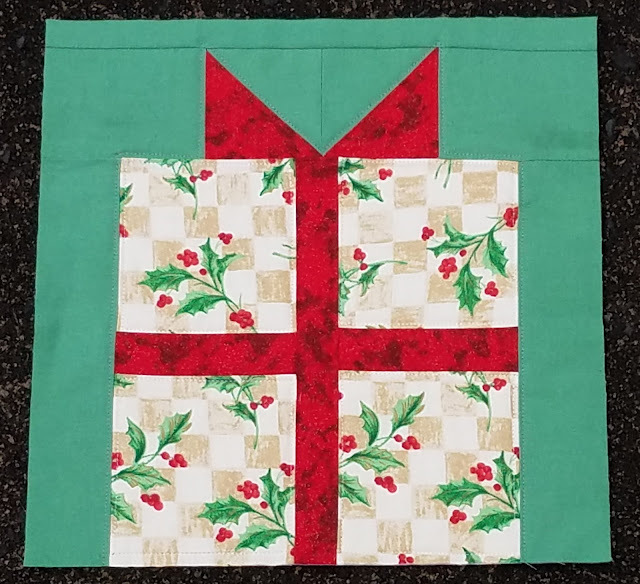 Many quilters used an alternate present block and I may look at options, or I may pick some other Christmas/winter element and use that instead. Or I might decide these presents are fine any use them anyway. I've still got a few weeks until all the blocks are released and made and I need to decide. I had been saying from early on that I hoped for a reindeer and block 9 did not disappoint! 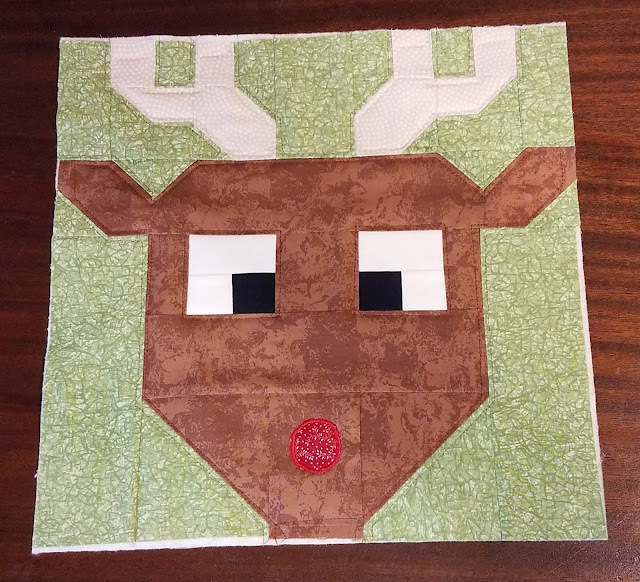 Snowy Days Quilting designed a fabulous reindeer block that is super cute! 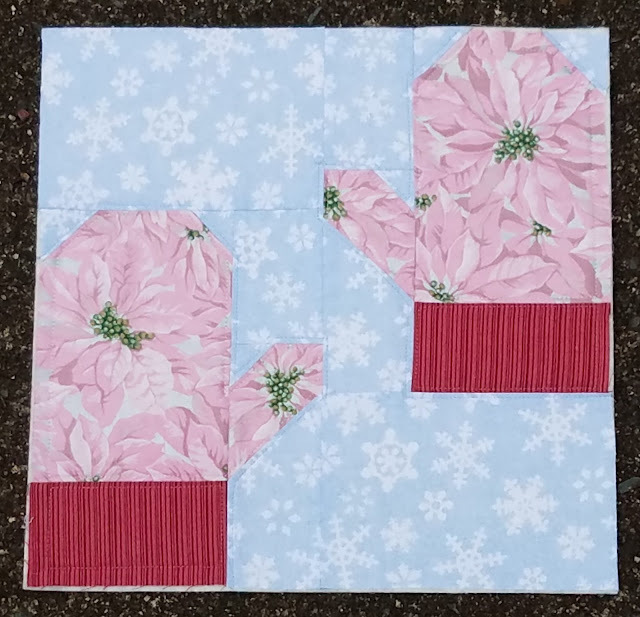 The facebook community for the QAL has been really great and since I rarely make the blocks the day the pattern is released, I get to see what everyone else does before getting started. I saw someone put a round nose on their reindeer and instantly knew I wanted a round nose, too. 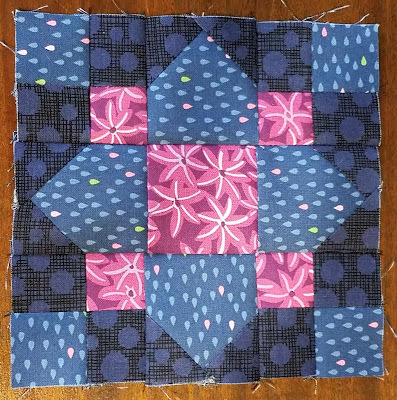 Once again, I used one of the circles from the AccuQuilt die that is for a train. I think maybe this reindeer needs a name. That brings us to the current block from Cwilt Fabric & Haberdashery. I admit, I didn't love the lantern when I first saw it. But when I saw people on facebook putting a candle inside the lantern, I fell in love. 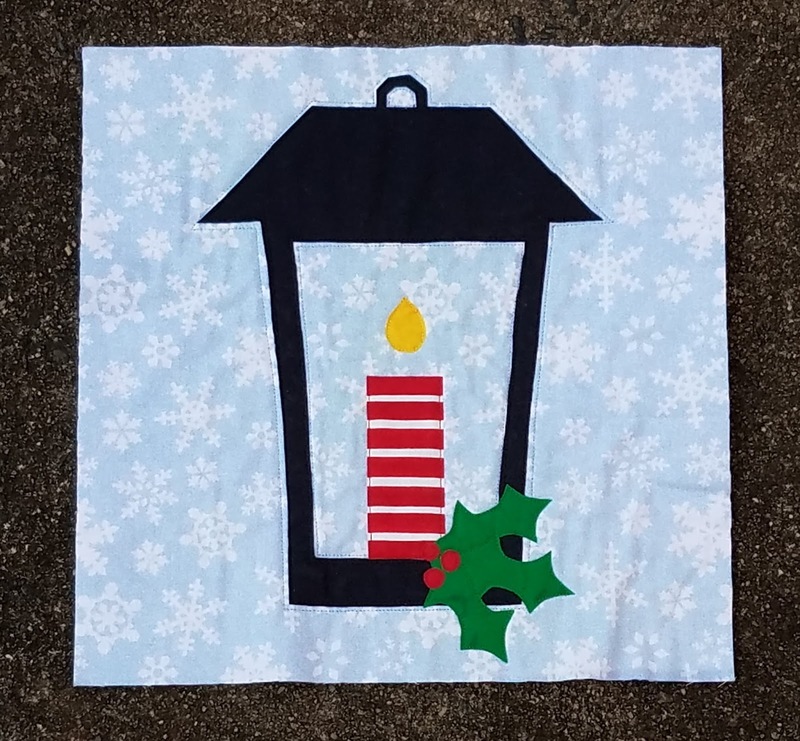 I used a candle and I took some of the other elements in the original block out, so mine is much simpler but I really like it. Holly is another item that I hoped would show up at some point, and while this isn't strictly a holly block, it checks that box for me which makes me happy. Only two blocks left! 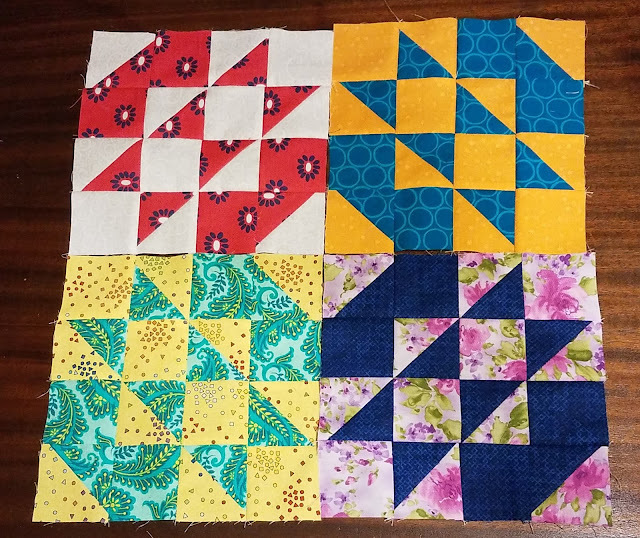 I have decided that I want my quilt to be four by four, so I will make four extra blocks to bring my total up to sixteen. Problem is, I don't want to duplicate anything and since I don't know what the last two blocks are, I can't make the extras yet. Sigh. I doubt this will be done before Christmas, but when I get down about that I just remember how much fun I'm having. 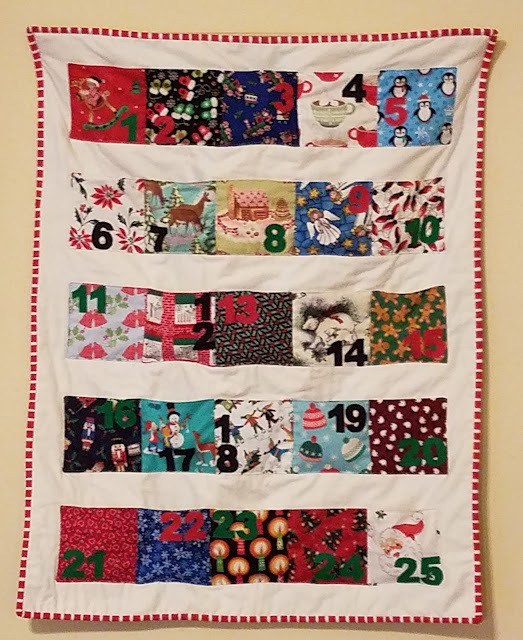 Several years ago, I saw a quilted advent calendar in a magazine. Munchkin was about a year old and I thought it would be fun to make while he was young. It's been in my thoughts for 3 years now, and on some finish along lists, but I haven't done it. Well, today is the day! (Or, rather, November 2017 is the month!) I am making it my one monthly goal to get this advent calendar done by December 1st. I went through all my Christmas/winter I Spy squares and picked out 25 for the calendar. 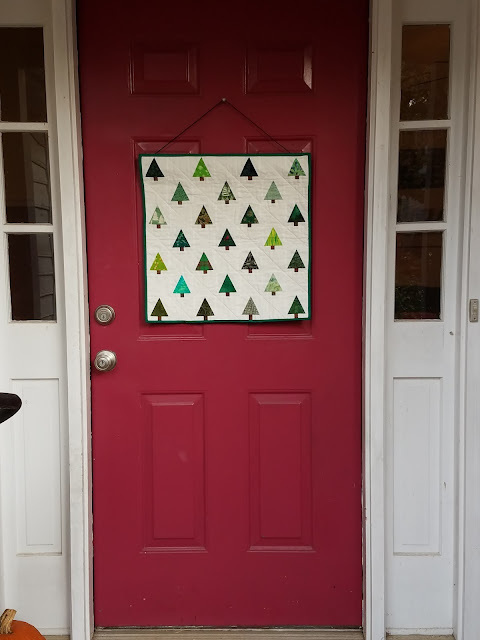 I'm linking up with One Monthly Goal for the linky party hosted by Patty at Elm Street Quilts. I'm behind in posting my bee blocks! Luckily, I'm not behind in sending them; most of these have long been received. Bee Inspired's September Queen Jen gave us all a lesson in the color wheel when she asked for LeMoyne Star blocks in tertiary colors. I had to go shopping for this one. This was my first LeMoyne Star and I am completely in love! September Queen Debbie from Stash Bee asked for tulip blocks. Debbie has been super generous to everyone in our hive, so I wanted to make her two blocks. In October, it happens that Janice was Queen in both bees! So I could chain piece her blocks. 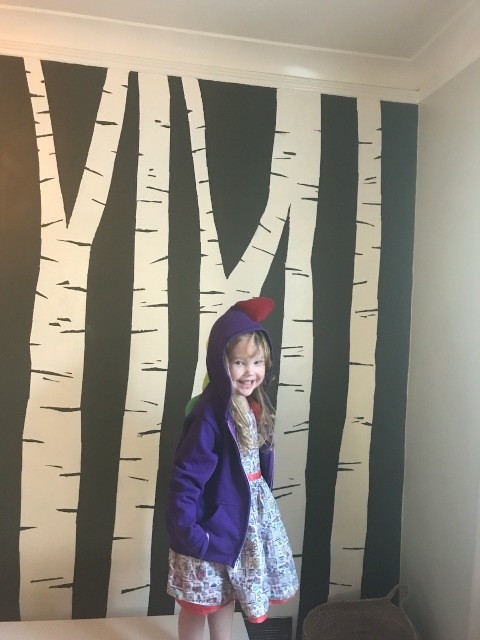 She picked a scrappy block and asked for high contrast between the two fabrics. If you look closely, you'll see that one of the blocks for Queen Janice has the same 2 fabrics as Queen Jen's LeMoyne Star from September. Stash Bee has 9 hives, and one of the queens from another hive asked for bookshelf blocks to make into a quilt for her 80-year-old uncle. He's a voracious reader and especially loves westerns, so she wanted cowboy/western themed blocks. 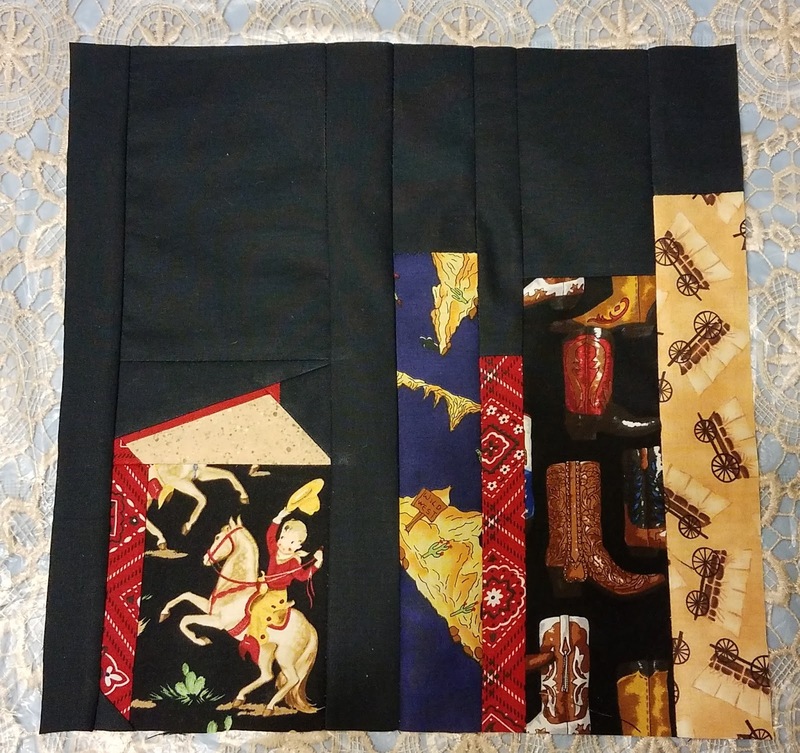 This was a perfect storm for me: I'm a librarian, I'm making my own bookshelf quilt (including blocks from last year's Stash Bee), I love novelty fabrics, and my mom is a big fan of cowboys/western things so she's given me several fabrics that would work. So I crashed that hive and made a cowboy bookshelf for Queen Kim. I love my online bees and the variety I get to make for people! If you are interested in joining a Bee, Stash Bee sign-ups for 2018 open on November 1st.